Getting Started: How Do We Get Young Women Interested in CS? Even with projected growth of 15-20% between 2012 and 2022, the vast majority of computer science jobs will be pursued and filled by men. As STEM-related industries on a whole add over 1.7 million jobs in the coming years, there continues to be a notable absence of women in the field. This trend begins well before entering the job market: girls account for more than half of all Advanced Placement (AP) test-takers, yet boys outnumber girls 4:1 in computer science exams. In Mississippi, Montana and Wyoming, not a single girl took the AP Computer Science examination in 2014. Why aren’t more women involved in computer science? Before the advent of the home computer in the early 1980s, substantially more women undertook computer science degrees. According to the National Center for Education Statistics, in the 1984-1985 academic year women accounted for nearly 37% of all computer science undergraduate students. This number steadily dropped as the widespread use of home computers became more common. A 1985 report on the everyday usage of personal computers within the home found that men were both far more likely to use a computer, and to use it for more hours per week than women. Only 27% of men reported not using a computer on a weekly basis, compared to 55% of females surveyed. As of 2010-2011, women made up just 17.6% of computer science students. Much attention has been devoted to studying the reason for this drop in female computer science majors. The central conclusion is that the first personal computers were essentially early gaming systems that firmly catered to males. While early word processing tools were also available, the marketing narrative told the story of a new device that met the needs of men. As more males began purchasing computers for personal use, the “nerdy programmer” classification began to take hold in the professional world of computer science. By the mid-nineties, the percentage of women studying computer science at the postsecondary level had fallen to 28%. Though women now represent 47% of the workforce, as compared to 38% in the 1970s, only 12% of engineers are female. Furthermore, the percentage of women working in computer science-related professions has steadily declined since the 1990s, dropping from 35% to 25% in the last 15 years. According to the American Association of University Women, there are a number of possible steps towards reversing this trend and encouraging more female students to undertake computer science. By fostering an interest in scientific topics at an early age or working to remove negative connotations and barriers, educators and parents can work together to help girls maintain confidence and curiosity in STEM subjects. For professionals already in the field, women can offer to be role models and mentors, while men can take a stand against sexist or prejudiced behavior in the workplace. Why should women want to work in computer science? Due to the marketing strategies of the last three decades, many women have developed misconceptions about computer science. While the notion of the geek coder is alive and well, many young women may be unaware of the myriad jobs available and the opportunity to make a palpable difference. The University of California at Berkeley experienced a revolution in their introductory computer science classes after changing how they marketed the course. What used to be known as Introduction to Symbolic Programming is now called The Beauty and the Joy of Computing. The result? For the first time in 2014, women in the class outnumbered men. A recent study by Deloitte found that women’s choices account for up to 85% of buying decisions nationwide. In addition to the impactful careers offered by computer science, it is one of the few fields where women have the opportunity to earn the same salary as their male counterparts. According to the American Association of University Women, the discrepancies in overall male-to-female pay rates have remained stalled for the last decade. Even as of 2015, women only make 78 cents on the dollar compared to men in the same position; however, these incongruities are far less pronounced, and perhaps even non-existent, within the field of computer science. As Smithsonian Magazine reports, a survey conducted by AAUW of 15,000 recent graduates found that, one year after graduation, male and female programmers were earning the same salary. The absence of a gender shift within pay scales also held true for other STEM-related (and traditionally male-dominated) industries, including math and physical science occupations. A recent study by Deloitte found that women’s choices account for up to 85% of buying decisions nationwide. Furthermore, studies concluded that diversity of opinion is integral to innovation. Though it is still commonplace to find boards and project teams without a sole female member, the integration of more women into the field will naturally lead to a more holistic understanding of the consumer marketplace. What are some other reasons for women to consider entering the tech field? In a report by the New York City Economic Development Corporation, researchers found that women working in tech companies – particularly start-ups – are much more likely to have a healthy work/life balance. Many tech companies are supportive of non-traditional professional procedures, such as working from home and employing videoconferencing technology. Furthermore, many of these companies also have flexible hours, allowing employees to work when best suits them, provided their projects are completed on time. Whether a new father, mother or adoptive parent, all Facebook employees receive four months of paid leave, in addition to $4,000 of “baby cash” to assist with unexpected costs. Furthermore, the company has set up breastfeeding rooms in some of their offices. Expectant mothers are given a total of 18 weeks off work, including up to four weeks before delivery. Fathers and adoptive parents are provided six weeks of paid leave. Additionally, both Apple and Facebook offer assistance with adoption and fertility treatments, including covering the cost of freezing eggs. This massive tech company offers a variety of family-leave provisions. All biological mothers receive 18 weeks of paid leave, with the number extending to 22 if any complications arise. All new parents can receive 12 weeks of paid leave, while primary caregivers are eligible for seven weeks. Aside from generous time off, the company also offers assistance programs to help new parents find childcare, discounts for agencies that place nannies, $500 towards supplies for a new child and special rooms for mothers to breastfeed. Consistently topping many lists of the best places to work as a parent, SAS goes above and beyond when it comes to serving women and families. In addition to a generous paid leave program, the company offers a variety of benefits as children are growing up. A subsidized onsite child care center means parents can visit their kids throughout the day, while the company cafeteria includes a special menu appealing to a younger crowd (think: octopus-shaped hot dogs). The company also instills a spirit of trust in all employees, allowing them to step away from the office whenever necessary, so long as their work is completed on time. Now that the historical reasoning and misconceptions have been overturned, it’s time to think about taking steps toward involving more women in the industry. Keep reading to learn more about fostering a passion for computer science in young girls. With the number of females studying computer science near an all-time low, it’s clear action needs to be taken. Understanding that the root of the problem starts at an early age is essential in rectifying it. According to recent coverage by The Journal, two-thirds of elementary-aged children indicate an interest in science; however, as they enter middle school, the percentage of interested girls falls dramatically. By high school, many girls who previously took advanced scientific courses drop their studies. Two-thirds of elementary-aged children indicate an interest in science; however, as they enter middle school, the percentage of interested girls falls dramatically. The summary offered above is corroborated in an extended report conducted by researchers at Florida Gulf Coast University and The University of Colorado, which cites numerous reasons for the drop in female interest as education progresses. In secondary school less emphasis is placed on developing girls’ computer science skills as compared to boys. Even those who go on to study STEM-related topics in college often report feeling they lag behind male counterparts, due to a dearth of attention at the high school level. Furthermore, female students lack relatable role models for inspiration, given that many leaders in the field are men. Lastly, the historic marketing and perception of scientific fields has catered largely to male students. While the geek-programmer characterization permeated the last decade, there is still a belief that STEM-related professions are often narrow, impersonal and unsuited for those who wish to make a difference on a human level. While boys tend to be more verbal in class, it’s up to educators to engage female students and bring them into learning initiatives and class-wide discussions. This will increase the likelihood of girls engaging with the subject matter and better prepare those who plan to study one of these topics at the collegiate level. Girls entering the field of computer science are likely to face more resistance than in subject areas more heavily populated by females. Adults can bolster their resolve by providing examples of strong, successful females thriving in their careers. Whether creating a mentorship program at the secondary or postsecondary level, bringing in speakers or using female leaders as case studies, both educators and parents can instill a sense of confidence in girls interested in pursuing a historically male dominated field by giving them role models. As discussed in the previous section, the number of women in computer science and related degrees dropped sharply in the 1980s in response to the message that home computers were mostly for men. In the interim years, women have shifted to subjects more typically referred to as the humanities or liberal arts, as evidenced by Forbes. A June 2015 Newsweek report featured Harvey Mudd College’s efforts to counter this trend. Rather than pure programming, its introductory computer science course has been reworked to focus more on creative-problem solving and the wealth of opportunities within the field. The school also lessened the intimidation factor by splitting the course into two sections based on the incoming student’s prior programming experience. The result? Within four years, the college went from 10% to 40% of women electing to major in the subject. Whether operating at the middle school, high school or collegiate level, these groups can be pivotal in both encouraging and sustaining girls’ pursuit of these topics. Outside of the organizations mentioned above, there are a number of other initiatives to engage girls in computer science. Whether it’s a competition, summer camp, science fair, MOOC or governmental program, the resources below will help parents and educators think outside the box when it comes to encouraging girls in scientific pursuits. This organization hosts a computer science and technology competition for middle school girls to develop a project to solve a social problem. Includes a project mentor. At this global technology program for girls emphasizing entrepreneurship, students ranging from middle school through college can compete to create and launch a mobile app while undertaking a three-month curriculum. Overseen by female mentors, these apps are presented to investors via YouTube, with the opportunity for finalists to pitch their ideas in Silicon Valley. This experiential summer camp created by the American Association of University Women is for middle school girls. The program seeks to make STEM topics both interesting and accessible at a crucial time when research has proven girls’ interest in these subjects tends to drop. This weeklong summer camp is designed to help girls see that STEM subjects can be fun and meaningful, starting at a young age. According to 2013 coverage by Huffington Post, one of the primary challenges facing STEM fields involves engaging enough students with the topic. Because careers in these industries are not well publicized, students frequently have preconceived notions about the type of work available to them after graduating. MOOCs, or Massive Open Online Courses, are free, abbreviated online courses that provide introductory curriculum materials to students across the world. High schools often take advantage of these courses, specifically in areas where there may be few teachers available. By engaging students in course materials while still in high school, the hope is that more will stay the course when it comes time to pick a postsecondary major. Whether at the local, state or federal level, the U.S. Government has enacted many initiatives to engage girls and young women in STEM-related topics, including computer science. In addition to national programs and campaigns, many states have created further initiatives to engage local middle and high school girls. NASA GIRLS This virtual mentorship program pairs girls with NASA mentors via video chat, allowing students to interact with and learn from role models currently working in the field. TechGirls Organized by the Bureau of Educational and Cultural Affairs, this international summer exchange program brings girls from the Middle East and North Africa to America, empowering them to pursue careers in science and technology. Stem Utah This statewide initiative is an excellent example of how the government can innovate and encourage girls’ interest in STEM topics. The website features an online library, contests and resources for students, parents, educators and industry professionals. Computer Science Education Week First created by Congress in 2011, CSEW is an annual, nationwide program devoted to inspiring K-12 students to take interest in computer science topics. The Council on Women and Girls The U.S. Department of Energy maintains this program, which spotlights girls who have excelled in contributing to STEM-related projects. NASA Girl Scout Partnership More than 66% of all astronauts have been involved in scouting, including 27 Girl Scouts. The administration maintains strong ties with the scouting community and offers varied initiatives. In a 2014 report by STEMConnector, researchers found that 20% of high school girls considering a STEM degree want to learn more about mentorship opportunities and motivational programs, while nearly 40% of females pursuing a scientific degree have a mentor. A 2010 report entitled “Why So Few?” by the American Association of University women verified these numbers, noting that mentorship is a pivotal measure for instilling interest and confidence in those who pursue STEM-related fields, especially those who haven’t historically been as involved, like young women. In the next section, we’ll review colleges throughout America with the highest percentages of women computer science graduates, and take a deeper look at how these programs are attracting and retaining female students. These school rankings are based off the latest data pulled from the Institute of Education Sciences regarding male and female graduates of computer science programs. Only four-year programs were included in the list, and those schools with less than 50 computer science graduates were removed. 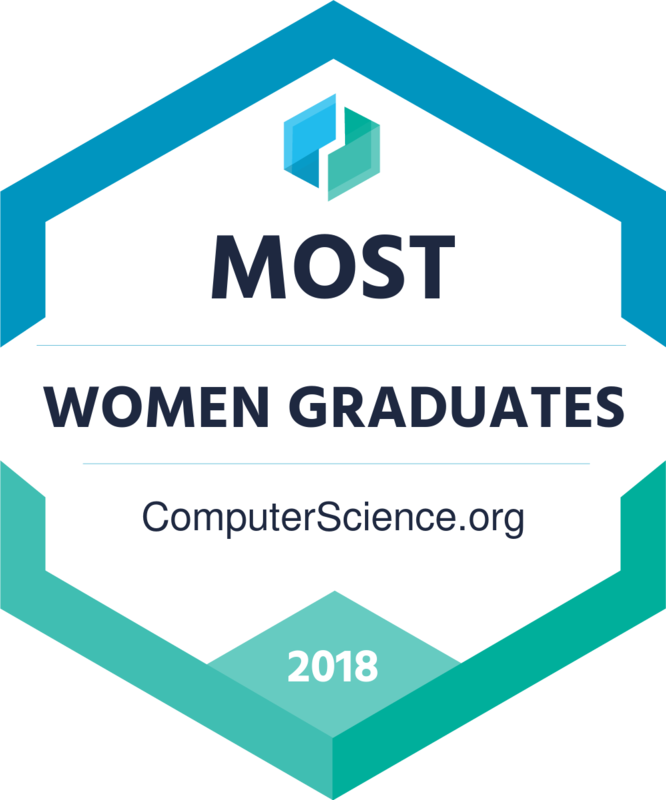 We first determined the average number of women who graduated from a computer science program (19.48). By dividing the school’s number of female graduates by this overall average, we discovered the average percentage of women in computer science programs; 16%. After dividing each school’s percentage by the average percentage, we added these two comparison scores to get an overall tally of how individual schools compare to national averages. The following schools were ranked based on the highest combined scores. OU’s computer science department consists of more than 30 PhD-level faculty members with experience in electrical engineering and computer science, and backgrounds ranging from government agencies to industrial facilities. Recent graduates have gone on to work for Microsoft, Amazon, GE, NCR, Boeing and Lexis-Nexis, among others. US News & World Report ranks OU’s School of Engineering #140 in the nation. US News & World Report ranks FIT #40 in the country for its online bachelor’s programs. US News & World Report ranks St. Leo #65 among southern universities. The CS program at PSU is divided into two phases: the first focuses on modern computer concepts such as programming languages and efficient programming. The second phase focuses on data structures, program languages and computing systems in greater detail. PSU ranks fifth in the nation for computer science citations within academic papers and ranks eighth in the nation for computer science expenditures. US News & World Report ranks MIT #1 in the nation for Best Undergraduate Engineering Programs. Many students at UW participate in faculty research, internships, co-ops and focused study abroad trips related to their major. The school is currently creating an additional building to house an ever-expanding student body, with Microsoft contributing $10 million toward the effort. The US News & World Report ranks UW’s graduate computer science department as the sixth best in the nation. This degree will prepare students to take both the Microsoft Certified Solutions Expert (MCSE) and Oracle Certified Java Programmer certifications. The program is also available as a minor. US News and World Report ranks Harvard #2 in the world for Computer Science studies. Students enrolled in Syracuse’s computer science program benefit from not only a solid foundation in CS principles, but also exposure to new developments and cutting edge technology. The degree is multidisciplinary in nature, allowing students to create an individualized program tailored to their future career aspirations. US News & World Report ranks Syracuse #58 among National Universities. US News & World Report ranks FSU #95 among National Universities. Advanced undergraduates are also eligible to take graduate courses in these areas. US News & World Report ranks Texas A&M #68 among National Universities. US News and World Report ranked USC Upstate #3 among southern public schools. US News and World Report ranks UN – Reno #194 among National Universities. US News & World Report ranks UNC Asheville #8 in its Best Undergraduate Teaching list. US News & World Report ranks JMU #2 among Top Public Universities. US News and World Report ranks UNC Chapel Hill #30 among National Universities. US News and World Report ranks Baruch College among the Top 25 Public Schools in the North. This one-time scholarship is open to graduate students enrolled full-time in their first year of a computer science degree program. Universities must nominate students, and the chair of the department must confirm the nomination. An extra $2,000 is awarded for travel and cost of attendance at a computer science conference. This one-time scholarship is open to graduate students enrolled full-time in their first year of a computer science degree program accredited by ABET. SWE offers hundreds of scholarships, awarding more than $660,000 in awards in 2015 alone. Applicants only need to fill out one application and will automatically be considered for all awards they are eligible for. WITS administers this scholarship, which is sponsored by Visionary Integration Professionals, and open to women aspiring to work in computer science or a related field. Female students hoping to be competitive must have at least a 3.0 GPA, high levels of participation in community service or extracurricular activities, and a thoughtful answer to their annual essay prompt. In addition to receiving funding, awardees are also flown to the Bay Area to participate in a two-day workshop with other women in the field. This scholarship is open to undergraduate females who have completed at least one year of their studies in computer science or a STEM-related degree program. Open to female undergraduate or graduate students studying computer science, computer engineering or a closely related field, this scholarship champions women who want to revolutionize the way we think about technology. In addition to funding, winners will be invited to the Google Scholar’s Retreat at their headquarters in California. This scholarship seeks to encourage the pursuit of scientific and technological education amongst female students, helping them to achieve their dreams of working in the field of computer science. Winners are selected based on an essay about what inspired them to pursue a career in technology. In addition to funding, recipients also receive a mentorship and possible internship. As part of the application process, students must develop a project using Openstack technology or Cloud Foundry. This program is for women who have recently completed a PhD in computer science or a closely related field. The goal of the fellowship is to recognize women scientists at critical stages of their career. Daybreak offers this scholarship to female computer science students with an interest in video game design. In addition to the award, students can also participate in a 10-week paid internship at Daybreak’s headquarters in San Diego. Since 2003, AAACF has been funding women pursuing computer science or technology-related degrees in an effort to build more interest in STEM topics. Applicants must have at least two semesters of coursework remaining and will be required to complete an essay consisting of three questions. This program is designed to provide stipends to female scientists undertaking research projects at their universities. Students will also receive mentorship from CRA-W members throughout their project and are encouraged to present their findings at the CREU conference. For the last four years, SWSIS has been funding female students studying information security and related topics at the undergraduate level. With an investment by HP, the organization is expanding the number of recipients for the next award cycle. This scholarship, which seeks to support women in their undergraduate pursuits, is especially focused on students in the most underrepresented STEM fields, including computer science. Preference is also given to Catholic institutions. This scholarship is open to Girl Scouts who earned a Gold Award for a STEM project and plan to pursue a career in a STEM-related field. Graduating high school seniors are eligible to apply. Open to female undergraduates pursuing a degree related to technology, this scholarship can be used for tuition, fees, books and/or supplies. Students in their junior or senior years are eligible to apply. Students pursuing computer science or related STEM programs are able to apply for this scholarship, which is awarded to students who demonstrate a passion for technology and leadership. The majority of awards are given to women, minority students or students with disabilities. Students actively pursuing an education in computer science or engineering are considered for the SanDisk scholarship, including those who are graduating high school, completing community college or currently enrolled in a four-year program. Students with a demonstrated financial need are given preference. Female students pursuing computer science or related degrees with the intention of working in national security are considered for this award, provided they are at least in their junior year. The scholarship is also open to graduate students. Applicants of this scholarship must be pursuing a computer science degree and must be legally blind. Selection will be made based on academic excellence, community service and financial need. MCWT offers a variety of scholarships, including those open to high school seniors, undergraduate and graduate students. The Girls Exploring Together – Information Technology scholarship is a four-year award broken into $5,000 annual disbursements.